This summer, I made myself a cropped jumpsuit, playsuit or whatever you'd like to call such a thing. It looked cute enough, but it could have done with a little more length in the torso... I won't elaborate on the implications but believe me when I say that I've only once attempted to wear it all day. Ever since, I've been considering a revisit of sorts. At first, I just wanted to make a long legged version of it, with that essential bit of added body length. Later, I started thinking about other options. Strange though the concept of the jumpsuit may be, I've spent enough time around people who like it to be somewhat intrigued. So, just before the holidays, I tried again. It's a completely different design from the one I made last summer but it incorporates tried and tested elements. I took the bodice of my pinstripe dress and changed the collar/neckline arrangement. To that, I added trousers based on my tried-and-tested belt pleated trouser pattern. This did involve some choices and guesswork because, as I learned before, you have to add lengthwise ease to the body section of a jumpsuit pattern in order to make it work in real life. 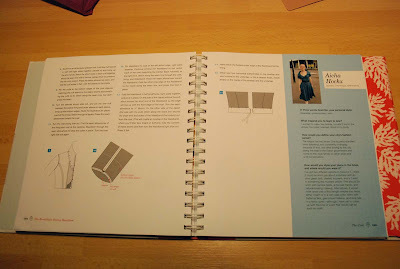 My pattern making book recommends between 3,5 and 10 cm. 3,5 cm is what I used before and which was inadaquate. Now, figuring that with the belt pleated bottoms, a low-hanging crotch might be OK, I went for 10 cm (which I think is actually intended for designs with blousey tops and with elasticated waistlines). Having horizontal seams in the body left me with the opportunity to alter this, if necessary. I first machine-basted the trouser section to the waistband to see what the length would look like. I decided to keep it as drafted. Then, I took them off again and did the back pockets. So, I ended up with a jumpsuit with a fairly fitted bodice, a dropped waistband and belt pleated trousers which taper towards the ankle. It has a blind zipper at center front, scoop pockets at the front and double welt pockets with button loops at the back. The neckline can obviously be adjusted with the zipper and is topped by a partially free-hanging collar stand. 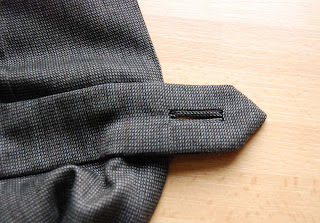 And the collar and the tab at the waistband have bound buttonholes. 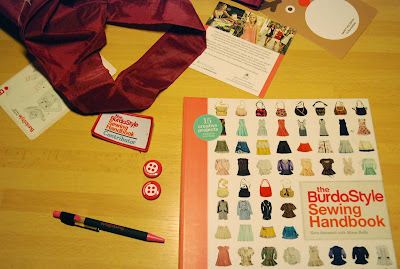 This is something I have mentioned before, but it's a while ago: I'm a contributor to the Burdastyle book. Like a lot of the others, I announced that fact on my blog when we were allowed to, shortly after we sent our garments to Burdastyle the summer before last. If you visit Burdastyle regularly, you will know that there has been a launch party (two in fact, one in New York and one in San Francisco. Unfortunately for me and other contributors worldwide, those were the only locations...) and the book is now for sale (Amazon.co.uk is listing it at two prices, with the with cheaper one available from 7 Januari. I think that's because is it at this moment only for sale in the US but will be released worldwide at that date. So, with the expensive one, you're paying for shipment). As a contributor, I was to receive a free copy. It was supposed to be sent out after the NY launch party but didn't arrive for weeks. I'm just so happy to get my hands on the book. It's quite a substantial thing really (judging from browsing through it. I obviously haven't had the chance to read the whole thing yet). 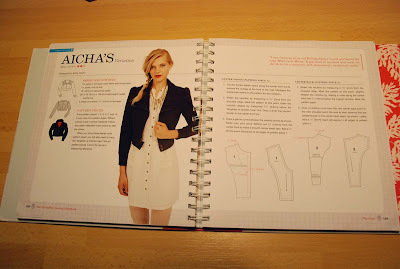 Spiral bound so you can keep it open and refer back to it while sewing, nicely designed and including a huge amount of information. They even explain basic things like how to use your sewing machine and how to use a cutting diagram! It's pretty cool to see the fruits of my labour on the glossy pages of a real book! P.S. If you are wondering about the obvious lack of frantic sewing for Christmas, you should know that giving presents for Christmas (although some people do it) is not traditional in the Netherlands. We have Sinterklaas, on the 5th of December as the occasion for giving presents (athat's mostly for kids). Are you still willing to believe me if I say I didn't mean to go without posting for so long? I hope you are. As I already mentioned, I understand my 'oh, look I made this' posts may not be the most interesting to comment to. However because I don't use patterns and often start new projects on a whim and because it's winter so there's very little daylight when I'm at home, they're all I can manage when I'm busy with other things. Right now, I'll only need to do a bit of hand-sewing to finish a new and more involved project. I'll show you later this week. I'm also still waiting on mail and email stuff, so I can, hopefully, tell more about projects I have been/will be involved in. 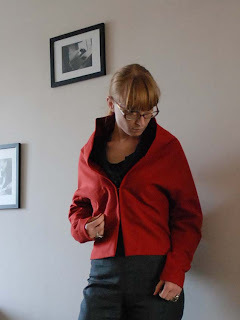 And, catching up on blog reading, I've noticed that many people have begun reviewing their year in sewing and/or announcing their intended last projects for 2011. I don't think I'll do the latter just yet, but I will try to take a good look about what I need/want for the holidays. 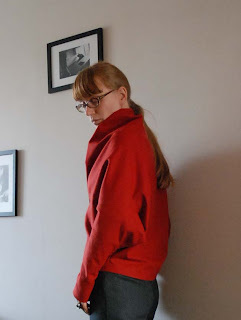 And finally, there is some real news in this post: when cutting the fabric for my now-almost-finished project, I decided I was fed up with my scissors. 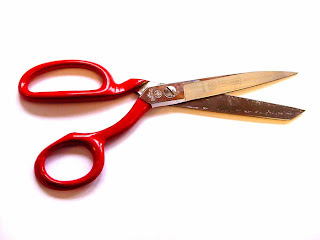 I've been making do for all these years with fabric scissors from Ikea (good value for money, I'd recommend to any beginner) or brandless ones bought at the notions stall at the market. All of those start out fine but soon develop their own idiosyncracies, leaving me with a drawer full of scissors (I've counted 5 pairs...) but having to make notches using paper scissors on thread clippers because none of them will cut at the very tip. They are not the fanciest scissors you can get, not by far. They are, however, very hard wearing. designer friend M uses this kind, and the workshop she works with as well. They will cut through almost anything (just not ideal for cutting very thin silks), keep their edge and they are not ruined by something as simple as being dropped on the floor. I bought mine from the same place where I bough my sewing machine, at what is (as far as I've been able to find out) a very low price. It's a Dutch site and shop, but for those few of you reading from anywhere near my location, I really recommend them. My first ever loose fitting sweater. It's a look which I think only works for me with skinny trousers, shorts or maybe with mini skirts. With those, I like it. I drafted a very simple pattern for this, basically just rectangles with some curves cut out. The fabric is a sweaterknit which is drapey and loosely knitted. And, to make things more interesting, I decide to try and immitate a structure well known from real knitted stuff: a cable. It's actually a braid made from tubes of fabric sewn into the front. It's a bit heavy compared to the rest of the sweater but I like the look. I considered using strips of fabric instead of tubes which would have kept the weight down but wasn't really an option with this knit (loose knits can easily unravel). But I want to show it to you anyway. I have been known to knit (I've got two perfectly wearable items in my wardrobe to proove that point. One of them, a little black cardigan, I wear quite often) but I'm slow. I didn't learn until my late twenties, so if I ever want to use knitting as one of my major methods of garment construction, I'll have rather a lot of practise ahead of me. Which doesn't appeal that much, I must confess. This lovely turtleneck sweater was made by my grandmother. She's in het eighties now and obviously belongs to a generation in which girls were taught how to knit from the age of four. Needless to say, she's very good at it. She's taken on a big project now: She is going to knit an item of clothing of their choice for each of her children (4), grandchildren (8) and children's spouses (2) (not sure about grandchildren's significant others yet, I guess she'll see about them when she gets through the rest of us ;). She did tell us not to pick any very fussy designs like cable knit or multi-coloured intarsia, but that still leaves a lot. I picked this sweater from a Phildar brand knitting magazine which I bought last year. It was written for, and executed in, their 'tweed' yarn. My grandma said (confirming my earlier experience) that using the yarn the pattern was written for, the first stitch sample was perfect and the whole thing was easy to knit. And, as you can see, the fit is spot on as well. Obviously, I offered her to let the other female grandchildren (so far, I've only bought ladies' patterns, of course I would be more than willing to pick up one which includes men's patterns for her) pick patterns from my (rather modest selection of) knitting magazines as well. That way, I can find her the right yarn for them and help her, in that little way, with her project. So, this afternoon I had a bit of time to take pictures of my latest creations and the sweater my grandmother knitted for me. I set up the camera and took my pictures quickly because I didn't have much time and the weather (and with it of course, the available daylight) was particularly unreliable today. Anyway, I'll show you the pictures of my new skirt now and re-do the lot of them this weekend. In fact, the weather was a lot brighter today, so there was some daylight left when I got home. And this time I actually managed to re-take my earlier pictures with any kind of charm ;) So I swapped the pictures in this post for new, focussed ones. 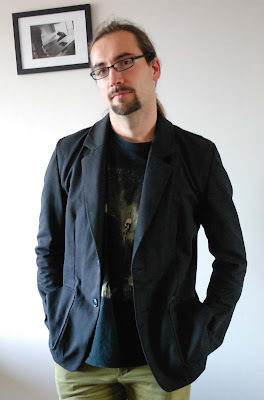 Between this post and the next, you may see a bit of a theme developing in my wardrobe... colour. And not just any colour but red and green in one outfit. In this case, it's the skirt that I made and the blouse which was a second-hand stall find (1 euro for a silk shirt, who could say 'no' to that...). I've wanted a pencil skirt in this fabric ever since I bought it. Pencil skirts and variaties of them are much easier to mix and match with all kinds of tops than fuller skirts and I just love the colour. Being a Dutch girl, I prefer skirts which allow me to ride a bicycle with little or no trouble. True pencil skirts aren't great for that, so I made this one with gores which flare out widely at the back. The back is also longer. The skirt has a high waistline which curves up at the front and it has pockets which wrap around the sides (sideseams only in the upper bit). I hope you can see most of these things now, but I will be back with properly focussed pictures. Well, at least we can discuss slopers, don't you think? As you will probably know already, a sloper is a basic pattern which (in our use. we're not talking about the garment industry blocks here, which are just slopers for RTW clothes) is fitted to the individual and used to make actual garment patterns. Your typical sloper is either very close fitting or has a 'small' to 'moderate' amount of ease and is shaped with darts. Some people prefer a 'no ease' sloper in order to have everything under control but in fact, almost every garment you'll ever make (in experience with the sole exception of a corset-style strapless top) will need ease, so a bit of ease in a sloper is not necessarily a bad thing. If you are drafting your sloper from a set of instructions, those will often have you include some ease straight away, usually by adding to certain measurements. 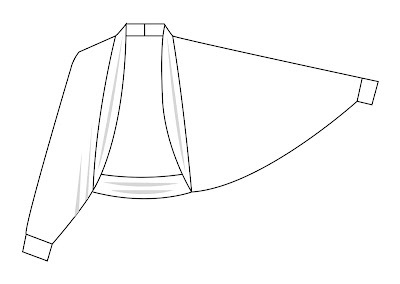 If you are using a ready-made sloper pattern (like the JJ sloper, which you can find here), you will have to fit it to you like any other pattern. 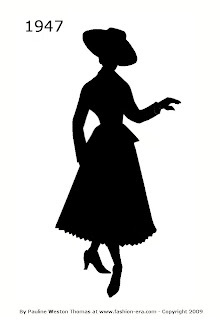 According to JJ's notes, her sloper includes wearing ease suitable for a fitted shirt, top or dress, so that should be perfect for drafting your dress. 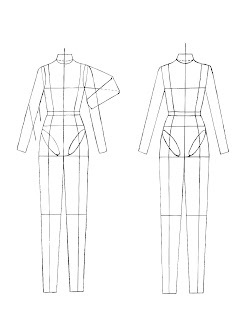 It is graded to Burda's bust and waist sizes, with instructions for a small bust alteration included on the pattern pieces. 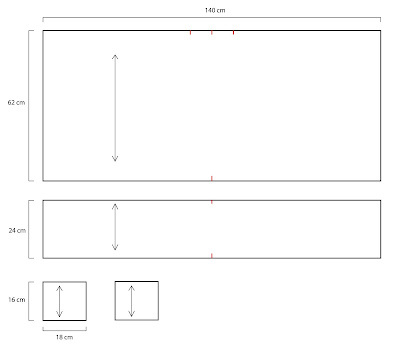 All sizes are, and this is important, drafted with one back length, 41 cm. Why am I repeating JJ's excellent notes? Well, I want to make sure everyone reads and understands them. Because all of this does not mean you can just make it up in whatever size you usually make Burda patterns in and expect it to be perfect. 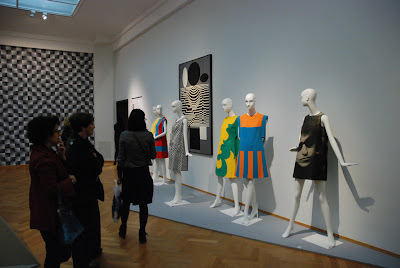 The Burda empire uses it's own blocks as a base for all its patterns. Blocks intended for wearers with the sizes mentioned in their sizing table. JJ took those sizes from the sizing table and drafted a set of slopers based on them. Because the sizing table only includes bust, waist and hip measurements, she must have had to guestimate certain other important bits of sizing information. So, to get the best result from her sloper, you have to take your measurements, check them against Burda's sizing table and pick your size. If you know you have either a small or a large bust your could make a small or large bust alteration straight away, again based on the measurements. The same goes for back length. 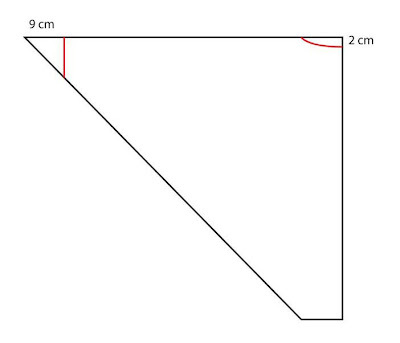 Personally, I know my back length (the measurement from the base of the neck to the waist, measured at center back) is 39,5 cm, so I would start by shortening this sloper by 1,5 cm. Be prepared for more alterations though, no sizing table or pattern making method can reliably predict individual differences in things like bust height or shoulder shape and width. I will post both my usual sloper and my progress on the JJ one here and in the Flickr group no later than this Thursday. 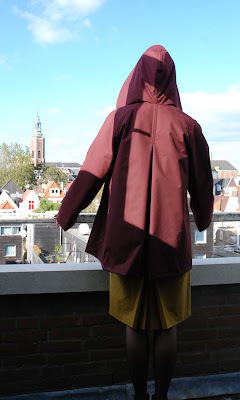 If you have a sloper completed, feel free to post it in the Flickr group as well. Just to show it off, or if you want help with your analysis of it. You know what happens when one is actually kind of busy but resolved to do something extra none the less, don't you? Especially when one starts feeling obliged to do well at the extra something because of the interest shown for it by quite a selection of rather cool people? Well, then you will understand what happened to me over the past week and a half. Total loss of blogging mojo, and, which is worse, of much of my sewing mojo. Which combined, made me even more ashamed about my performance in this draft-along I planned. This past week, I have done some other simple projects to claw back my sewing spirit and I'm glad and relieved to report that it worked. Now, let's get back to the draft-along! Right now, when I'm typing this, it's 7 A.M. and I will have to leave for work in an hour or so. When I return home, around 6 P.M. I will finally write that post about slopers. 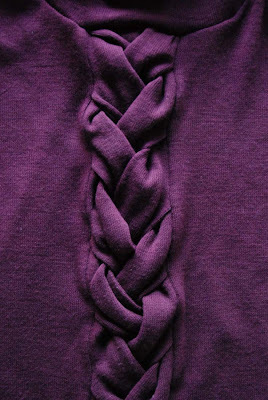 I have also decided to stick with the rather simple shirt dress design which I posted in the Flickr group. Two weeks ago, I had ambitious plans about posting several designs and discussing the merits of the different looks. However, while that is all very nice and is, in fact, sort of the way you would learn to design stuff if you actually went to school for that sort of thing, it is not how I usually work. I'm not great at sketching, so I usually do a lot of my considerations in my head, only committing at least half-baked plans to paper. And making an even slightly scanner-ready sketch takes more time than making one for 'at home design' use. Oh, and shirt dresses are fun and versitile, they can be made to flatter many different body types and are easy to fit into a 'normal' wardrobe. All in all, in my humble opinion, not at all a bad choice for anyone's first self-drafted dress. Well, I'm going to leave you for now with this picture. Although this is not sewing-related, I thought it would be fun to show you the result of two things I haven't made time for in, maybe, years. Getting a different hair-cut and having someone else take my picture (it took a lot of pictures for just one decent headshot, let me tell you). More this afternoon. Have a good day! Well, time for a quick update I guess. I've adressed a couple of the design issues and there are a couple of sketches in the Flickr pool now. I have to say I feel a bit humbled by the sketching skills of both ladies. Other than that, it's great to see how other people think about designing their dresses. I'd love to see more there and I will be adding more of my own. I would also like to emphasize that you can use the Flickr group as a testing ground for your designs. Please don't feel like you have to come up with a perfectly executed sketch of your final design. It's great if you do, but, especially if it's your first time doing this, it may work better to do some rough sketches of different styles, post all those you kind of like and use the comments you get to make your final decision. Of course, designs should be considered in relation to body shape, as I've pointed out before. Overflowingstash had a great suggestion about that: she wrote that you could trace a picture of yourself, to make a custom croqui, thus both showing your shape and preserving your modesty. In the Flickr group, there's a great example of just that by Barbarain. If you don't have the drawing skills of either of these ladies, you could just settle for tracing the contours of your body in the picture, creating a silhouette. Obviously, we will still be talking about designing our dress this week but it's also time to start being practical about it. Step 1: making and fitting a sloper. Several of you have your own slopers already. Of course you can use those, especially if you know it's quirks. For those of you who don't, this is the link to the JJ sloper on Burdastyle. I will be making and fitting this one myself (unless I get the impression no-one will be using it, that is) and show the process. You can also try this one, found by Sewing Princess. 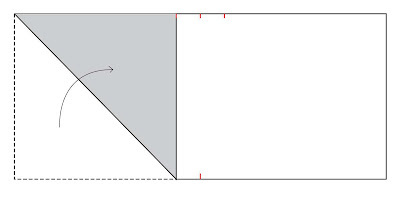 In her comment, she described it as a drafting instruction, but the link she included leads me to a downloadable, and editable sloper in size 10. I'm not familiar with it myself but it looks like any standard sloper. Overflowingstash also commented with this link and this one which are for making plastic wrap and duct tape dummies respectively. The plastic wrap method will allow you to create a zero-ease sloper. Again, I have no personal experience with this method and, taking her word for it, I'd advice caution. All comments with these links can be found here. I hereby interupt the scheduled draft-along posting to show you something else I've made. 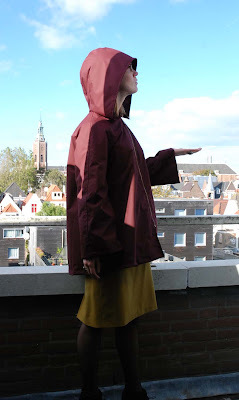 My raincoat is finally finished. I finished it on the day the rain (relentless this week) stopped. 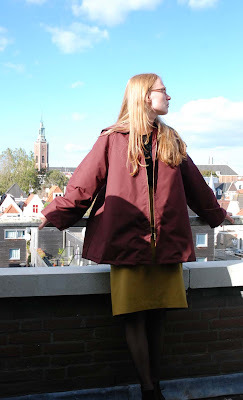 I announced my intention to make this coat weeks ago, and I haven't really strayed from my original design. 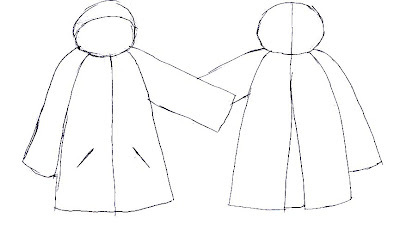 A wide raglan-sleeved coat with wide sleeves, a back pleat and a hood. It is fully lined and has a zipper closure. My own pattern, of course. I feel like it took me ages to make though. In the muslin stage, there was a lot of sewing machine related anxiety. It just kept skipping stitches which did some serious harm to my sewing mojo. After cleaning and changing needles, it slowly recovered when I ditched the crinkled linen I used for the muslin. After that, it was just the material which kept progress slow. Plastic coated fabric means no ironing, no re-doing anything and not a chance at easing anything in. On monday, I suggested considering your proportions as one of the starting points for designing your dress. Today, I've decided to try and show what I meant by that. In general, seamstresses have a better idea about the shape and size of their own bodies than other people. After all, a lot of sewing time goes into fitting and altering-to-fit. As a pattern maker, you will need to hone that awareness even more. 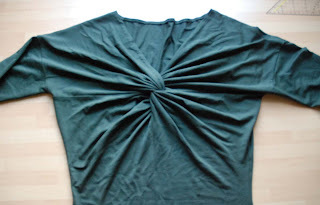 And after all, we've all been there, made something because it looked so good in the pattern magazine or on the envelope, spent many hours making and fitting it only to end up with a garment which doesn't actually suit our body and our style. Pattern making (especially for a beginner) takes even more of your time and you won't want all that effort to be wasted. From the front we see a long neck, angular shoulders, a fairly featureless upper torso and a significant difference between waist and hip, with the widest point fairly far down, at the top of the thigh. The legs are shapely. All in all, the body is a bit bottom-heavy. From the side, the most striking thing is its flat-ness. Breasts hardly stick out, the stomach is flat and buttocks are there but make a fairly small curve. These are the observations. Having made these, consider what to emphasize with clothes. Forget the beauty/fashion magazine tricks for dividing women into apples and pears, rulers and inverted triangles. Although their tips can be useful, each woman's body is different and not every woman may want to work towards the same 'ideal'. Just to give and example, I filled out one of those body-type questionaires once and it said I was a ruler. When I look at my front view though, I'd say I'm a pear. Granted, a rather small pear, but still. Personally, I like my waist-to-hip ratio and I like that wider hip in general. I feel it's what gives me a feminine figure, despite being skinny. It is also very appropriate for a vintage-inspired dress. Because of it, I think I can pick any of the skirt shapes I mentioned before (pencil-skirt, A-line, circle skirt, gathered skirt). I think for length, depending on the style of the skirt I can do lengths between 15 cm above and 10 cm below the knee (the latter only for very full skirts). And ankle to flour length of course, but that's not really what I'm going for now. t for vintage styles which are all about ladylike curves. Of course, there are tricks. For a 50's-style dress, I usually keep a bit more ease at chest that at the waist and I don't go for any of those (very period accurate) smooth bodices with high necklines. Mine is an upper body flattered by the roomy drape of a cowl neck or by big collars which grow from V shaped necklines (a 'bare' V-neck is out of the question, of course. Now that is a style for the bigger busted ladies among us). All those design elements add width and fullness at the bust. To show off the small waist, I like to wear my vintage style dresses with a (usually dark coloured or black) belt. abaffledcat, Jacqueline deRuyter, Barbara, tantmonokrom, Ewa, Amy (I did read your comment about not having time now, but you may want to be signed up anyway so you can follow along later), ginevra/occasional glimpses, Anna Keaton and overflowingstash. Please get in touch with me through aicha_hockx AT hotmail DOT com to get your invitation to the Flickr group. Of course you can also email me at that adress with questions or if you've only just decided to participate in the draft-along. 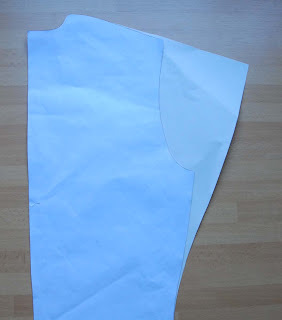 The point of this draft-along is, as I explained in this post, to draft a retro-style dress, using Burdastyle's JJ sloper, or any other bodice sloper you may have as a starting point. I chose to start with ready-made slopers and to include only simple design details in order to make this a fun way to start and experiment with making patterns. The malfunctioning poll was intended to tell me which style would be the most popular, so I could work on that, making only minor detours to explain simple other options. As it is now, I will explain all three skirt options, some sleeve options and any not-too-difficult bodice/neckline issues which proove to be popular in your designs. In my previous post, I suggested everyone tries to make a design for herself. I'm not doing this because I too lazy, too busy or not sufficiently creative to come up with a good idea myself. No, I did that because, to me, that is the great advantage of making your own patterns: you are not bound to anyone else's design, you can make what you like and what works for your body. I will discuss design options and designing for specific body shapes this weekend. I have also set up a Flickr group for the draft-along. I thought it would be wise to make it 'by invitation only', just to keep out random weirdos but that means I have to invite each of you by email or Flickr-account name (you can also be invited to the group, and participate in it, if you don't have a Flickr account, so don't worry about that). If you already signed up for the draft-along (and have an email-adress in you blogger profile or mentioned it in the comment) I will email you about this. If you haven't yet and want to be part of it, you can email me at aicha_hockx AT hotmail DOT com. And finally, someone commented about not being able to find the JJ sloper. This surprised me, but guess what: it's gone. The Burdastyle member who created it isn't listed anymore, so I guess she went and took her creation with her. Burdastyle does offer this sloper dress pattern, but it's only in size 38 and of course, the JJ sloper lives on in Elainemay's Coffee Date dress, which was based on it. 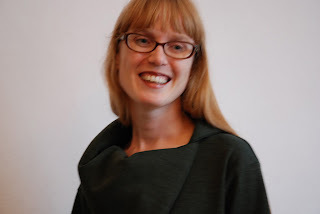 Although I think the Coffee Date dress is lovely, I would not recommend using it as a sloper because of the scooped neckline and narrow shoulder (although it could be used for something like a sleeveless cowl neck bodice). I noticed that many of you have your own slopers, so this may not be so much of an issue. Again, I will email those of you who signed up already, but if you don't receive a messege from me, or if you're only signing up now, please tell me if the missing sloper is a problem for you. We'll find a solution. Please read the comments to this post to find out how to download the JJ sloper. Claire found out more about it: it got mysteriously re-named when they changed the website. 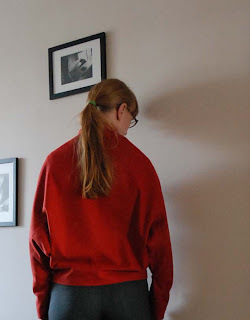 Just follow Claire's excellent explanation to download the sloper. 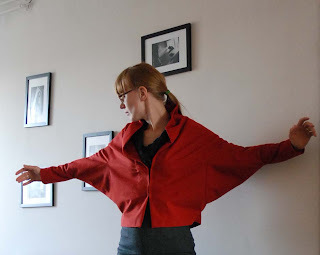 And to answer Nancy's question: I will either show you how to draft a sleeve or draft a multi-size sleeve to fit the JJ sloper and unload that to Burdastyle. Hi everyone! I'm sorry I didn't get the poll-thing to work properly but I don't think it was too much of an issue. After all, most of you mentioned your prefered design details in the comments and it won't be a problem to discuss more than one of the options for most parts of the dress. I think it's good to draw up a bit of a time schedule for the draft-along (although it's still flexible). Some of you mentioned being busy until mid-October and after that, the Holiday season will creep up quickly. From my point of view, it would work well to think about design during this week, fit slopers (for those who need to do that, with the help of the experienced pattern makers among us) next week and start with the actual drafting in the second half of the month. This should allow us to have finished dresses in the first weeks of November. If that's all right for most of you, I'll try and make it into a proper schedule. I'm going to make a Flickr-pool for the draft-along (which I've never done before) and I will email everyone who signed up with the information about that. For now, I'd like to suggest that you try and sketch up a design. Don't worry about not being good at sketching. I'm not that good myself but it can still be helpful in developing one's ideas for a garment and/or a pattern. For quite some time, I traced shapes to make my sketches work. Fashion drawing instruction pictures for the little ladies with my previous post, but usually the picture you see here, Burdastyle's wire croqui. By now, I'm sufficiently used to the croqui's proportions that I don't really need it anymore. 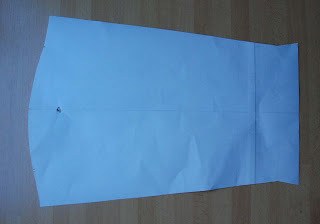 You can just print the croqui and put it under the sheet of paper you are drawing on or you can import it into Illustrator (or any other kind of drawing software, I guess) and put it in a layer under the one in which you are making the actual drawing. Who wants to draft along? Hi everyone! Who wants to join me in drafting and making a dress? I plan on using the (free) JJ sloper from the Burdastyle website and (if necessary) I will draft and upload a matching sleeve for it. 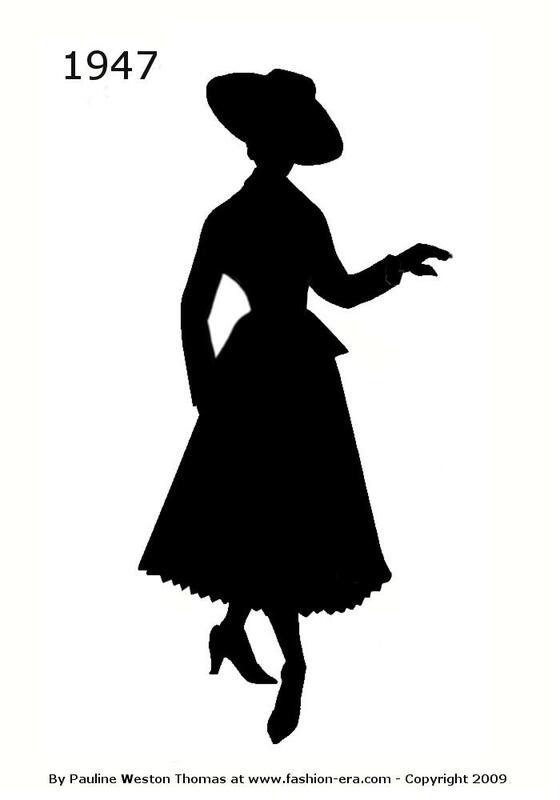 I will discuss fitting the sloper and of course, if you have your own sloper or want to draft your own using either Pattern Magic or Winifred Aldrich, I'd be happy to give any advice you may need. Of course, we have to decide on what kind of dress to make. Making your own patterns opens up a world of possibilities, even if you've already decided to stick with a classic dress shape with a waist seam. So, if you want to draft along, please leave a comment and take the poll. Vote for as many or as few elements as you would like. Rest assured that this won't limit the draft-along to something you may not like. I intend to discuss several options within the same general design, and adding a different skirt is always easy. Poll: Which design details do you want for the draft-along dress? I actually had the whole of last weekend off (I've been working every Saturday since March, excluding my vacation) and thought I could get a lot of drafting done. I had just managed to forget a little chore which was really getting in the way of me creating more patterns: My old patterns had taken over my sewing room. I'm usually hanging my patterns on coat hangers which I keep on a rail in my sewing room. However, the coat hangers are those cheap all plastic ones and I had the one carrying my dress patterns had bent out of shape and fallen down months ago. I had put it slightly out of harm's way on the floor and left it there for consideration at some other moment when I might be able to make time of that. And on Monday evening, I did make a tentative start on a new project. 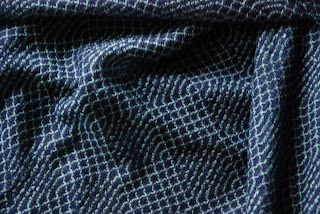 I want to make a raincoat in some plastic coated, aubergine coloured cotton which I bought on sale a few months ago. I've been thinking about it all through the rainy months of July and August. I have lowered the armscyes of a raglan base pattern which I made last year. I made a muslin, hindered by a terrible bout of stitch skipping from my beloved sewing machine (it might be because of a bad needle, since I already cleaned, oiled and checked for issues with the bobbin and with thread tension. O please let it be the needle...). It's sort of OK, but the angle of the sleeve should be changed to allow more freedom of movement and I think it's not quite as wide in the body as I would like. Being all wide and open, it won't be the most practical of rain coats, but eh... I'm fine with that. I'll be back soon with updates on the raincoat, and posts about the things I said I wanted to write about. Here it is: E's finished jacket. He has been wearing it for a few days now and says he's happy with it (in case you are wondering about the trousers: he usually wears black jeans, but now, for the weekend, he was in the leaf-green bermudas I made him last year and it's already quite something to get him to pose in his new clothes). It is funny to see him struggle into it, though. Because this thing is shaped like a proper men's jacket, it has higher and narrower sleeve heads than he's used to (from shirts and casual jackets) and it's unlined so it doesn't slide easily over his shirt. 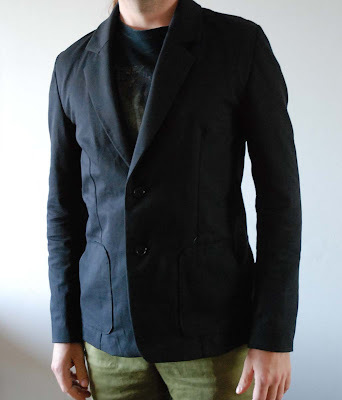 I think I already told you the basic facts about this jacket: it's made from black cotton twill, in the shape of a traditional men's jacket. I used flat-felled seams where I could and bias binding everywhere else. 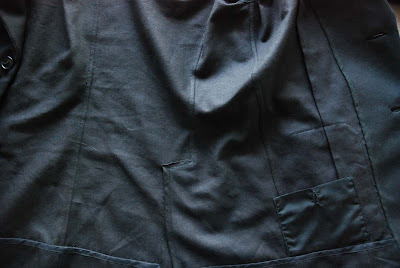 It has patch pockets which have slanted openings to the side and at one side a hidden inside pocket. By now you've probably noticed the fitting issue which is still annoying me: there is a rather obvious line pulling from the neckline to the armpit. It wasn't like that in the muslin. And what's more: I think I know why. I didn't make a muslin with the fully constructed collar on. 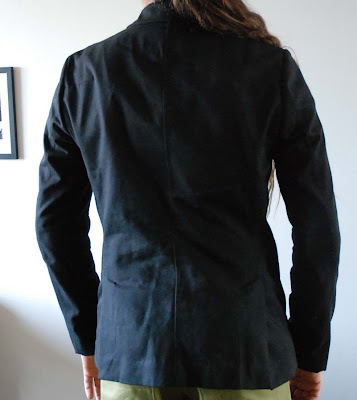 The back neckline of the muslin, with it's clipped seam allowances, must have stretched out making it wider than the finished neckline-with-collar... And E has an unusually thick neck (one of the reasons I started drafting patterns for him in the first place).